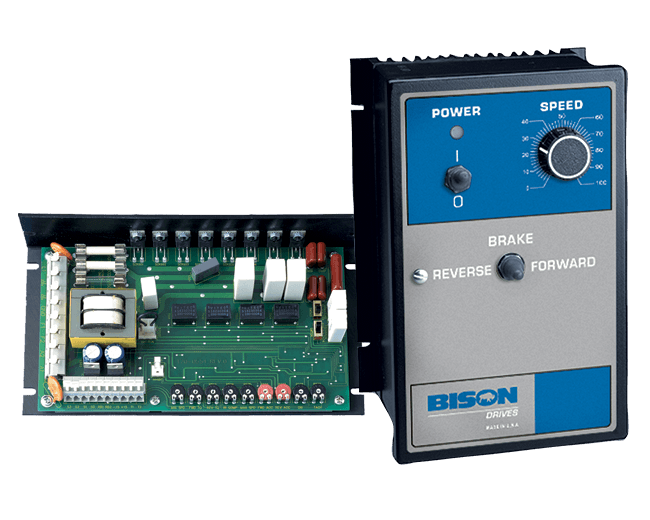 Bison’s Regen Drives consist of full-wave, four-quadrant regenerative SCR controls to provide smooth motoring and braking torque for brush-type DC motors. Control motors from 1/20 through 1 HP for single or bi-directional variable speed, without using mechanical contactors. Speed Range and Regulation: 1% regulation over 50:1 speed range. 1% regulation over 60:1 speed range with the addition of a tachometer for feedback. 4 Quadrant Reversing: Regenerative / 4 quadrant drives have the ability to perform quick, contactorless, reversing on-the-fly. Stopping Modes: User can decelerate (N.O. ), regeneratively brake (N.O.) or coast the motor to a stop (N.O.). User can also decelerate to minimum speed (N.O. ).